Why use a reusable water bottle in my child's school lunch? This is what I have been asking myself…. I admit….in the past I have been kind of lazy when it comes to the drink in my kid's school lunches. I usually send a juice box for my elementary age child and water bottles for my older kids. I would just send the plastic throw away water bottles. I know, I know…bad for the environment….but sometimes convenience wins out with a tired mom! Why Use a Reusable Water Bottle in My Children's School Lunches? I like to save money….I have had some decent luck getting good deals on juice boxes with coupons….but these deals are not all the time. When I ran out of 100% juice…then I may be tempted to get the cheaper boxes of “fake” juice. The plastic water bottles are fairly cheap…but not as cheap as water from our faucet! 🙂 There is an upfront cost to buy a nice water bottle, but over time I think it will be much less than buying drinks for 3 kids to take in their school lunches all school year! My kids do not need fruit juice. Even if it is 100% juice it has a lot of sugar and calories in it….and it just isn't necessary! I would much rather them eat a piece of actual fruit. Good old water is better for them. We have filtered water in our kitchen sink and I don't have to worry about possible recalls of bottled water like I have seen happening more and more lately! I am not going to pretend to be a super green person….but I do feel bad throwing away hundreds of plastic water bottles every year. I want to try and take small steps to do my part! I think this will also be a good “green” lesson for my kids! The reusable water bottle is there…ready to fill with water. I don't have to wonder if I have any juice boxes to put in their lunch box in the early morning hours! I can honestly say…that has happened…multiple times! 🙂 We are out of bottled waters or juice boxes and it is 5am…that won't be a problem now! 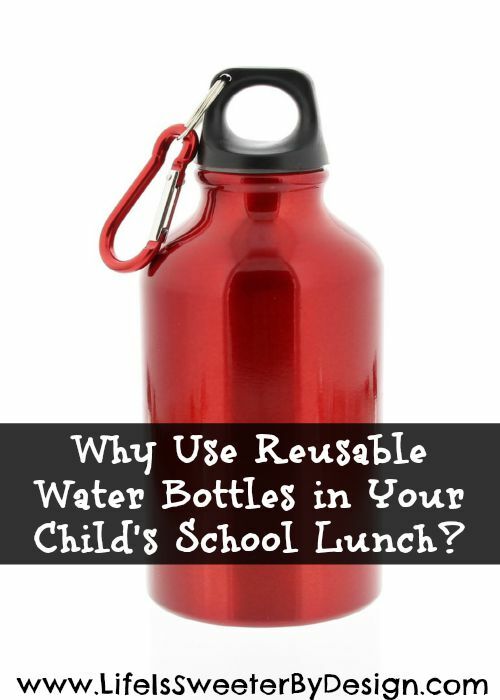 Do your children use a reusable water bottle in their lunch? What are your reasons for using a reusable water bottle? You can read about some awesome, MUST HAVE Lunch Box Accessories that will make packing your child's lunch a breeze! I agree…an easy way to make a small difference! Yes!! They are so great for walks!